PandaTip: A well-written contract separates professional freelancers from inexperienced amateurs. By taking the time to customize this template with details related to your client and the work being performed, you’ll demonstrate your professional acumen and expertise. This freelance graphic design contract is made on [Agreement.CreatedDate] between the Client and the Designer listed above. The Designer agrees to provide graphic design services as listed in the “deliverables” section below. PandaTip: Use the deliverables table in the next section of this template to list the items you’ll be submitting to the client as part of this freelance graphic design contract. The Designer agrees they will remain the sole provider for the term of this project. All work will remain unique, original, and free of any plagiarism. PandaTip: Most freelance graphic designers require a small retainer before beginning a project, with final payment due upon a project’s completion. If your payment terms are different, you can reflect that by changing this section of the template. The Project above shall be conducted and delivered upon payment of the below listed amounts. All fees will be invoiced upon submission of deliverables to the Client, and will be due under [Payment.Terms] payment terms. A deposit of $[Deposit.Total] will be due to the Designer prior to the start of any work. If the Scope of work changes during the project’s completion additional costs may occur. Designer will submit any price changes to the Client prior to beginning such tasks. PandaTip: This section of the freelance graphic design contract template protects your client’s intellectual property while granting you the right to use completed works as part of your digital portfolio. The Designer hereby acknowledges he/she may be involved in or become aware of information that relates to the client on a personal level including information related to the client’s past, future, present, customer names, marketing plans, project information, and financial documents. The Designer agrees to protect all the above information and keep any information obtained confidential. However, the Designer will be permitted to display final work on their website or in promotional materials. The Client will be notified and must approve any and all materials prior to project finalization and submission. Furthermore, the Client will have permission to accept the work and request revisions if needed. PandaTip: As a freelance graphic designer, it’s important to protect the time that you invest in client projects. This section of the template makes it clear that your client is responsible for paying you for your work even if they cancel the project before it is complete. Either party may terminate this contract at any time for any reason they deem necessary with written notice. Upon cancellation of this freelance graphic design contract, the Client will be responsible for all expenses incurred prior to contract termination. Should the Client choose to cancel this project after the project’s completion, the client will remain responsible for full payment of the complete project total. By signing below, the Parties agree they have read, understood, and will comply with the terms listed in this freelance graphic design contract. 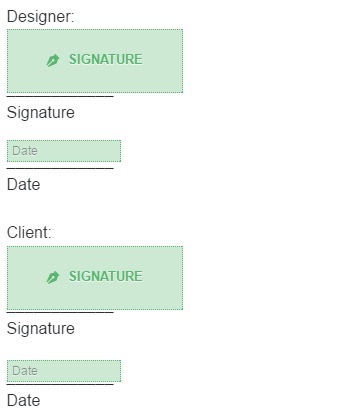 PandaTip: PandaDoc’s electronic signatures allow this template to be signed from any computer or mobile device.